Attention fans of Peristeria elata, the Dove Orchid. 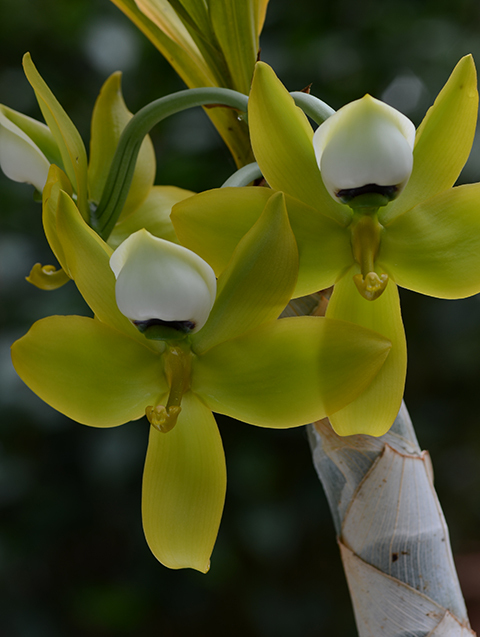 Allow me to introduce you to the Swan Orchid, which is flowering now in the Orchid Display House. Notice the graceful arching neck (the column), the white body (the lip) and chartreuse wings. Okay, it's an inverted swan, but never mind--it's lovely. Cycnoches warscewiczii is just one of 30 or so species of Cycnoches, the Swan Orchids, which grow in the American tropics. Cycnoches produce flowers that are usually either male or female. In some species the male and female flowers look so strikingly different that they were initially thought to be different species. 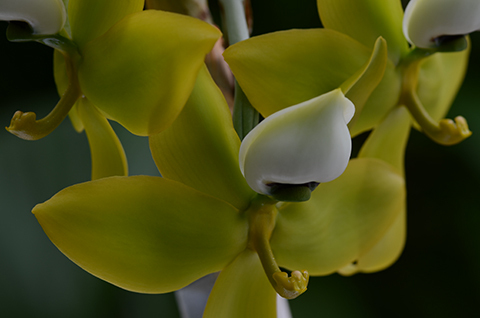 If you love orchid fragrances, you will want to experience this one. Like so many other Euglossine bee-pollinated orchids, this one smells delicious. Acquiring pollen involves a sort of trapeze maneuver on the part of the bee. Even so, pollination isn't on his agenda at all. His goal is to simply to collect the liquid fragrance from the flower's lip, probably for pheromone production. As the bee grasps the margins of the lip with his two pairs of front legs, he releases his grasp with his two hind legs. His abdomen swings downward and touches the tip of the column, accidentally discharging the golden pollen masses onto his back. The bee finishes collecting the fragrance and off he goes, cologned and resplendent, in search of yet more fragrance. Does he notice his cool new bling? Probably not. Eventually he arrives at a female flower, which he unwittingly pollinates while collecting fragrance.